I used to scoff and scowl at people who collected vinyl records, thinking it was complete horseshit. But then I got into it, almost by accident. Being an avid collector of old newspapers and antique books, I was naturally attracted to finding and collecting old vinyl records. My preference is 1940s jazz, or maybe some Stan Getz from the 1960s, during the bossa nova era. Now, I have a small, but growing, collection of vinyls and I love them. You can find stuff that is unavailable on digital and they sound better. Much to my surprise, vinyl sales actually outpaced digital last week for the first time ever. Wow. Vinyl sales made the record industry £2.4m, while downloads took in £2.1m, the Entertainment Retailers Association (ERA) said. It marks a big shift in music consumption. In the same week last year, vinyl albums made £1.2m while digital ones made £4.4m. Downloads have been in sharp decline as consumers switch to streaming services. 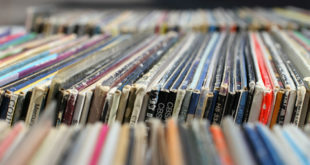 The ERA has suggested the surge in vinyl sales could be attributed to the popularity of vinyl as a Christmas gift and the growing number of retailers – including supermarkets such as Sainsbury’s and Tesco – which now stock vinyl. The format has now shown eight consecutive years of growth since facing near extinction in 2007, although it still represents less than 2% of the overall music market. I don’t consider myself an audiophile, just someone who likes quality. I found it to be very difficult to buy a new vinyl record player, since most are made in China and complete crap. If you’re looking for a gift this Xmas, and I get nothing out of this recommendation, try Uturn Audio, based out of Boston. After a lot of research, I chose to buy my turntable through them and have been very happy ever since. It’s worth noting, I used to spend no less than $40 per mo on iTunes music, but have cut that down to zero. Primarily, I listen to music via my Alexa device, using Amazon music through my Prime account. Since I don’t listen to new music and prefer music from antiquity, this is perfect for me and has just about everything I want for free, save the annual fee I pay for prime.